Stripe Kit does complete car and is for 1969 only since 1970 Yenko featured LT-1 identification. 13-Piece Kit Includes: Hood with SYC, fender, door, quarter stripe with Yenko SC, trunk stripes and headrest decals. Indicate color. 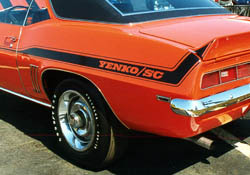 Left & Right quarter stripes with Yenko S/C callout at the rear of the quarter stripes. Left & Right outer spoiler stripe tips. Stripe kit does complete car and was created for 1969 only. This kit can be purchased with or without the SYC callout and features 3M High Performance 2 mil cast vinyl. Did you know that the 1968 Yenko Camaro featured the wrap around factory nose stripe that turned on the fender and continued onto the door.